Well done Tesco Burnley. Now how about a slow lane for older customers? Categories: Education, Lifestyle, Relationships, Work | Tags: ASD, autism, autism spectrum disorder, Burnley, customer service, Lancashire, slow lanes, Tesco | Permalink. Room safes too small to hold a laptop. All we want is decent customer service! The Times travel section has identified a list of things which it believes irritates us when staying in hotels. Room -orientation tours – isn’t that just touting for a tip? Overcomplicated light switches – absolutely agree. In Lithuania last week I still hadn’t worked out all the possible combination when I left. And getting back to your room to find your iPad or phone hasn’t charged because you turned off the power by mistake…. Too short kettle cords – yes, I was on my knees looking for a socket. Tiny teacups – or it my case those glasses they serve cafe latte in. I hate them. UHT milk – horrible stuff, couldn’t agree more. Klepto-proof clothes hangers – not see those for a while. Bad Art – try a literary themed room! Gauzy white curtains – or wooden venetian blinds which also let the light in. Hairdryers – not a problem last time but I know what they mean about the wall mounted ones. Wet rooms – not experienced them but dodgy showers are just as bad. Had to complain three times before they changed shower head and it became a proper shower. Arty sinks – can’t fit a kettle under tap and awkward access. Absolutely. Sewing kits & shoe polishers – not a problem for me along with shoehorns and free slippers. Toothpaste – yes, would be helpful. Pillow mountains – definitely. I end up piling them on settee or on floor. Mini-bar prices – probably still are a rip-off but I never use them. Premium wi-fi – not a problem in Lithuania where I was but strongly object to paying for it in UK. Breakfast that stops at 0800 – never experienced that. 1000 or later is my experience. No baked beans – obviously a Brit thing. Any further ideas send them to The Times! Categories: Happiness, Lifestyle, Recreation | Tags: annoying habits, customer service, hotels | Permalink. My local Tesco has introduced a new way of serving customers today. 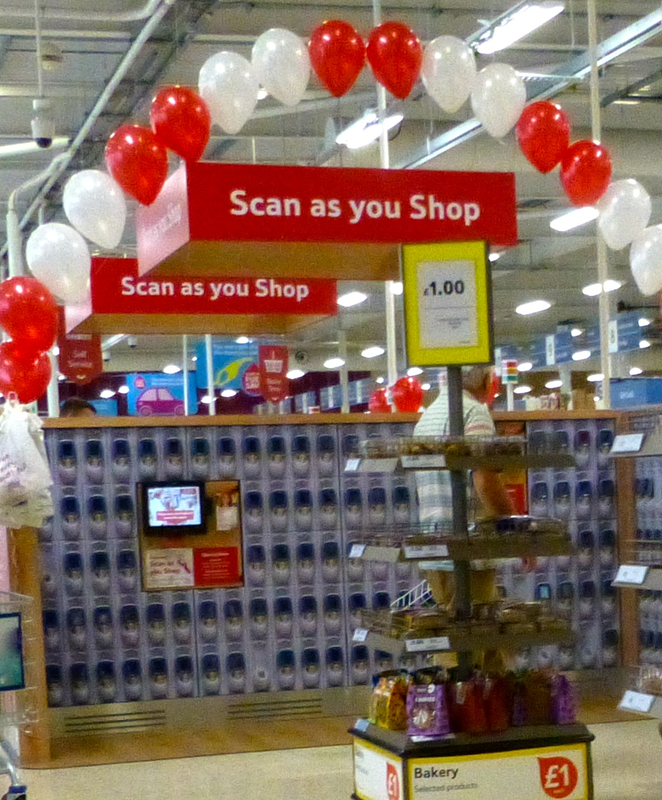 It’s called Scan as you Shop. Basically after registering your club card you pick up a hand-held scanner and do your shopping. You pick your items, scan them and put them straight into your own bags in your trolley. Then when you’ve finished shopping you pay at the checkouts and you’re done. Well you need to be a club card holder so that will add you to their marketing database. Any other problems? Well although stores generally won’t admit it it’s generally believed that there is more stolen through using self-serve checkouts (1 in 5 customers according to one source). This idea opens up even more opportunities for people to put items in their bag without paying for it. In the instruction leaflet you can see that the first point they make is that you have to scan every item – to ensure an accurate till receipt. Of course that’s why they are telling you to do it. Don’t honest people i.e. most of us, understand that you have to scan everything you’re buying? Then see the point about what they euphemistically call “service checks“. 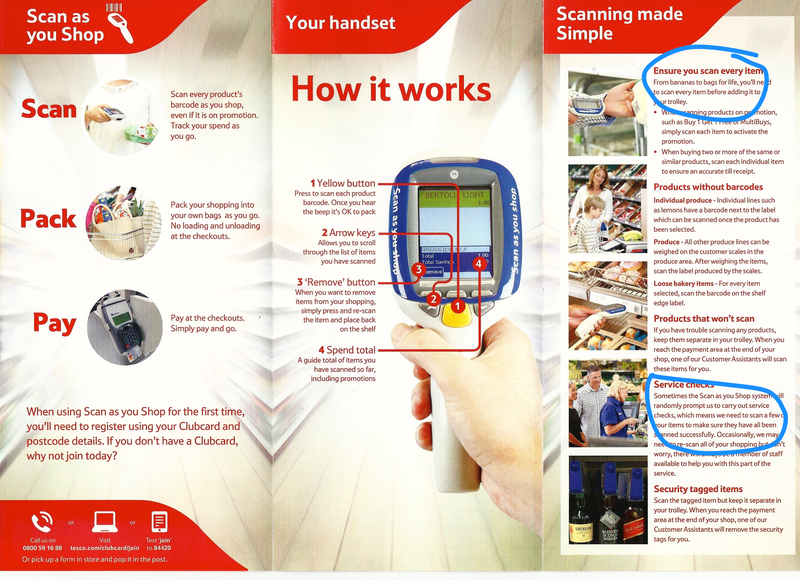 The leaflet explains that sometimes you will be randomly chosen to have some items re-scanned, maybe the whole trolley “to make sure they have all been scanned successfully“. Of course that’s the reason, and they haven’t been watching you on CCTV? I admit I’m a Luddite when it comes to customer service. I like to have an interaction with a human being which is why I don’t use internet banking (part from its security flaws). I‘ve posted on this before when they introduced the self-service checkouts and I still won’t use them. I’ve complained several times to Tesco managers about the shutting of checkout lanes at peak times and all they say is that the shifts have finished and they’re doing the best they can. Well who organises the shift rosters if not the managers? Have they heard of twilight shifts? A checkout assistant recently told me that although she was on a permanent contract all new staff were on zero hours contracts and if they refused two offers of work they were out. How can that attitude encourage staff to give of their best and provide a good customer service? Tesco is losing market share, its customer service is getting worse (in store and on-line), and introducing more machines for shoppers to contend with is not the answer. When Tesco tried to expand into the American market with Fresh & Easy my understanding is that it relied heavily on checkout machines. See where that got them, they lost a fortune (£1.2 Billion) before pulling out. I don’t see any evidence of that and certainly not with this latest gimmick. As Edmund Burke, a British philosopher, once said “Those who don’t know history are destined to repeat it.“. Categories: Work | Tags: customer service, Fresh & Easy, Luddite, Scan as you shop, self-service checkouts, self-service machines, service checks, shoplifting, Tesco, zero-hour contracts | Permalink. 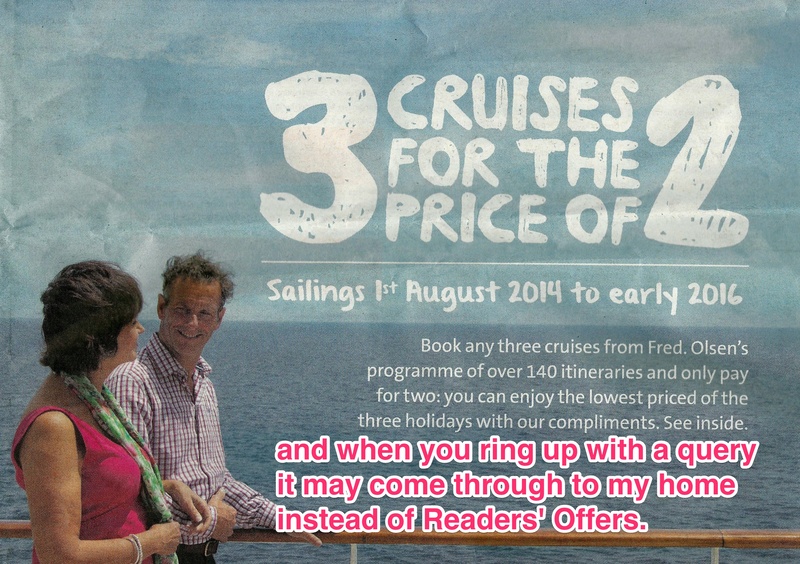 Readers’ Offers? No I’m a private citizen! For years I’ve been plagued with telephone calls intended for readers’s offers at the Olsen Line. When I answered the phone I patiently explained that although they’d rung an 0845 number it was coming through to my house. Some people don’t believe me, especially when they ring back within a few minutes and it’s me again. Most are apologetic. Sometimes they’ve left messages for me – some with people desperately ringing from airports. I ask them to tell the shipping line about the problem when they do get through to them but nothing has changed so either they haven’t told them or the shipping line doesn’t care. I used to ring people back and explain but no more. Just thought I’d let you know. Categories: Recreation | Tags: cruises, customer service, Olsen line, wrong numbers | Permalink. 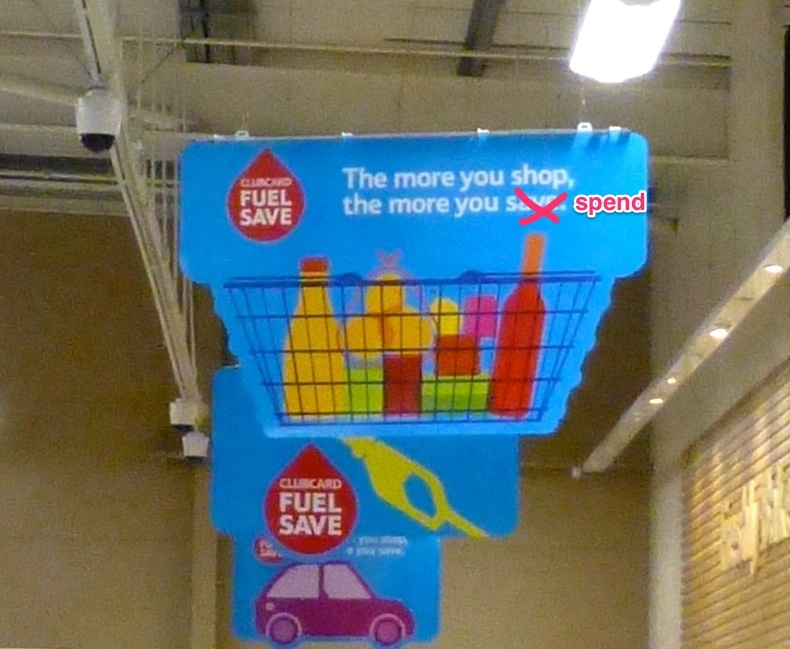 Tesco needs you to spend more but do they value their customers? Tesco hasn’t been doing so well of late. CEO Philip Clarke hasn’t delivered on his promises and their overseas ventures in the USA and China aren’t doing much either. According to the financial pages pressure is mounting on both the Chairman, Sir Richard Broadbent, and the CEO. Britain’s leading store is losing out to what the trade calls the “discounters” i.e. German firms Aldi and Lidl. Now Sainsbury’s is relaunching the Danish brand Netto (which sold its stores to ASDA some years ago when it found it couldn’t compete with the Big 4 – how times have changed) to add to the pressures. For me it’s about a decline in customer service as much as the prices (although so-called bargains aren’t all they seem to be especially when buying multi-packs). Going into my local Tesco extra the other day to buy a handful of items I found that both “basket” tills (used to be the fewer than 10 items tills) were unstaffed, yet again. For the past 12 months or so only one has been open anyway and I’ve complained about that several times, clearly to no avail. On this occasion I was told that they were always closed at 8.00 pm. The supervisors say they are short-staffed but that I can use the self-service machines, which I detest (and I know I’m a Luddite when it comes to them but it’s costing jobs and the staff don’t see it). Today I went int M&S and as usual on Sunday they had two regular checkouts and one member of staff on the basket tills. Seeing that the people in front had only a few items we joined that queue only for the machine to freeze. They had to move the customer to another till, boot up the system and start again. A second member of staff came to open a second till and when I mentioned the long wait she said they were short-staffed. Then I went into fast-growing discount store B&M (which bought the old Focus DIY store and since 2013 has had ex-Tesco boss Sir Terry Leahy on the board). It was really busy but to get the queues down and customers served quickly they put a packer at each till and the people moved through very quickly. The stores want our business (and how I dislike that Tesco slogan about shopping to save) but aren’t prepared to put enough staff on to make us want to go back more often. Categories: Work | Tags: Aldi, B&M, customer service, discounting, Lidl, M&S, Netto, self-service machines, Tesco | Permalink. This is good customer service! I’ve often complained about poor customer service so I’m pleased to report excellent customer service. I bought a Gtech Air Ram vacuum cleaner just over a year ago and it developed a fault last week and I couldn’t get it to work. I rang the customer service number on Thursday and the lady who answered said she’d get someone from technical support to ring me back within the next 8 hours. Within an hour I had a call from someone who checked my details and confirmed it was still under its 5-year warranty. I’d bought the machine at Comet, now sadly departed our high streets, but that wasn’t a problem. They asked me to pack it up securely and a courier would collect it the following day, on the Friday. So the courier took it away on Friday afternoon. On Monday I had a text saying I had a delivery coming the following day. And sure enough on Tuesday they delivered a Gtech for me. Not just a repair but a replacement. And what a fast turnaround. It’s a great piece of kit and that’s great customer service! Categories: Work | Tags: Air Ram vacuum cleaner, customer service, Gtech | Permalink. DHL an efficient German delivery service? Nein, nein, nein! I ordered an Icelandic sweater from a company in Iceland. They handknit them so it takes a few weeks. Then they told me It had been despatched. So far so good. I didn’t receive notification of when it would be delivered so when they did I wasn’t at home and they couldn’t leave it because I had to pay duty on it. Bit of a downer but half-expected. The delivery company was DHL, which is part of the company which runs the German postal service. They left a card with various contact numbers to arrange payment of the duty and redelivery. I rang the first number and was put through a series of automated responses, none of which met my need to have the parcel delivered near my home at one of their service points. So I rang another number and was transferred to what was obviously a call centre in India. I had a “phonetic” conversation with an operator (the line was bad and so was her English). I wanted to pay the duty and re-arrange delivery. She could only deal with the first by which time I’d decided to pay the duty on-line anyway rather than risk any transaction errors. She promised to put me through to someone else to arrange re-delivery/collection but after a minute or so the line went dead. Perhaps it was taking too long for her to meet her targets and I was only the customer after all! I then had to go back on-line to pay the duty, which was straight-forward, and eventually managed to arrange for me to collect it at the service point at Ryman’s in the town centre new where I live. They confirmed by e-mail and said it would be there on Friday after 1500. I waited an extra day and went to collect it from the service point. Problem was they didn’t have it and had no idea where it was because they couldn’t use the live tracking system. I told them I wasn’t happy and that it was poor customer service from both DHL and Rymans. The staff in Ryman’s said basically it wasn’t their problem but DHL’s. (DHL must not be paying Ryman’s for the service then?) They did ring customer services for me but there was no-one there as it was a Saturday and they don’t work weekends. So now I don’t know where my sweater is and won’t be able to get any further information from Ryman’s until Monday afternoon. This is not good enough and when companies use these automated response systems rather than have a real person on the end of the line (and one who speaks English well enough to understand you without having to spell everything out for them) it makes you determined not to use them if you can avoid it. DHL claims to be the largest global delivery service so why doesn’t it invest in some decent customer service? Categories: Work | Tags: customer service, DHL, Ryman | Permalink.